Contexts, as many of you know, is a hybrid journal/magazine published by the American Sociological Association for the last dozen years. Every few years a new team of editors is selected. Three years ago Jodi O’Brien and I became the editors. Our latest—and last– issue is hot off the presses. That’s a bit of an overstatement. 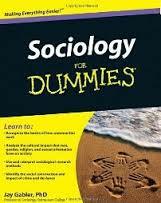 We’re not the only public face of sociology. There are others as well. 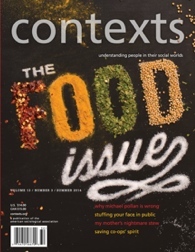 But Contexts is the ASA-endorsed and resourced public sociological magazine. It resembles other sociological journals insofar as its peer reviewed, and draws its authors mainly from among sociologists. But there are a number of things that make it unique: First, it departs from the standard article format. Articles are shorter and more narrative in style, and eschew specialist language. Second, it conveys its story through the use of images—graphics photos– as well as text, and also through the use of sound–podcasts. Contexts raises some larger questions about the politics of scholarly communication in our discipline and beyond. It suffers from a bit of an identity crisis which illuminates how the pressures of professionalization clash, at times, with the urge to popularize. Some would like Contexts to be a glossy mass circulation magazine, the discipline’s answer to Popular Psychology, or Atlantic Monthly—a magazine of ideas with an audience that transcends professional sociologists. But a project like that takes enormous investments of time and money that ASA hasn’t really been willing or able to commit to. Perhaps that’s because ASA members haven’t pushed the discipline to do that. Consequently, Contexts operates, I would say, more like an AJS or ASR lite. It provides an opportunity for sociologist to translate their work to other professional sociologists and students of sociology. And this, I think, is the principal source of some sociologists’ ambivalence toward Contexts and its goals. When we speak of public scholarship, public sociology, or even “popular sociology,” I think we should differentiate between two linked but somewhat separate processes: translation and dissemination. Most conventional understandings of public scholarship focus on the process of dissemination—getting our work out to broader publics—which often means getting media attention.That is, we do our research in tried and tested ways, and then we send it out into the world, hoping that it will catch the eyes of journalists, policymakers, and others. Sometimes university media affairs office, or a publicist at a publishing house, or sometimes even a paid publicist pitches in. Some types of sociological work lend itself well to dissemination, and pickup by media outlets. Dissemination is important—it gets our research out there—though not always in ways that we intend. But there’s another dimension of public scholarship, that I would term translation. This is what academics are not as good at. In effect, I’ve come to see Contexts as a training ground for the work of translation. 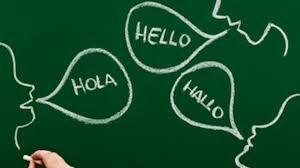 Translation requires one to conceptualize one’s work somewhat differently—to make it engaging to nonspecialist audiences. It requires rethinking the audience in your head—transforming it from a finite group of other experts, such as your dissertation committee, or experts in your field, into a group of people you may not know at all, who may not share any of your expertise. In a recent book, about writing, the linguist and psychologist Steven Pinker says that the cause of most bad writing, he says, is not laziness or sloppiness. It is what he calls the “curse of knowledge”: the writer’s inability to put herself in the reader’s shoes or to imagine that the reader might not know all that the writer knows—the jargon, the shorthand, the assumptions, the received wisdom. 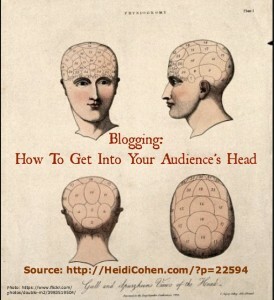 Translating means changing the audience in our head. It can also entail finding the narrative, the story, in your research that can transform a complex argument into one that draws non-experts in. This requires showing and telling, painting a portrait of a group, a scene, or a trend that unfolds over time, offering thick description while analyzing what is occurring beneath the surface of events. 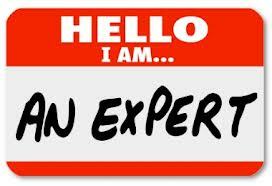 As academics we are all about creating and disseminating knowledge, and that is what we are rewarded for. But there is, I believe, is a time and place for taking ourselves out of our place of privileged insight, to think about how we might share that knowledge with others. We shouldn’t do this out of the goodness of our hearts, or because we want to gratify our egos and our desire for attention—but of course those considerations always play roles. We should do it because it makes our work better. By bringing others in conversation with our work before and after publication, we also have the ability to test our ideas out and make them stronger. Graduate students who are reading this may be thinking: this is all fine and good, but I need a job, and in order to get a job in an increasingly competitive market, I need to be pumping out journal articles and playing by the rules. Junior faculty members may thinking: well that’s all fine and good but I need to keep my job–and prepare for my next promotion. Senior faculty members may be saying to themselves: well, that’s fine and good, but things are working okay for me, so why ruin a good thing? I’m not suggesting that translation should be all that we do. There’s a time and place for high-level conversations with our scholarly peers of course. But in the rush to professionalization, we’ve forgotten how to speak to other audiences, and we no longer collectively value it. The reward structure of the profession must change in order for us to make translation more than simply a hobby we do on the side of our “real” work, or something we feel that must cover up in order to be seen as “professional.” It is changing, very slowly. I’m encouraged by a number of small-scale efforts to encourage other kinds of scholarly communication— initiatives like Discover Society, Sociological Images, Society Pages, and Public Books. I’m intrigued by those who are using new modes of sociological writing and representation such as performance –Les Back and Nirmal Puwar in the UK, and Patricia Clough and Jackie Orr in the US. And I value the kinds the critical discussions about the politics of scholarly communication that are cropping up in the blogosphere, at sites like SociologicalImagination.org. What these and other initiatives suggest is that many younger scholars in particular are looking for different ways of communicating their research. As a first step on this path, I suggest that rather than deride the label “popular sociology,” we should proudly embrace it. This entry was posted in Uncategorized and tagged #engaged academics, academics, American Sociological Association, Contexts magazine, culture, experts, sociological imagination, sociology. Bookmark the permalink. Thanks for this piece. I think you are right, and I think Steven Pinker is right: it’s about translating our stuff into prose digestible who don’t know what we know. A historian friend of mine liked this: http://ralphbuncheinstitute.org/2014/10/04/will-china-bury-us-and-bury-india-too/, and since I always think historians write better than we do, I thought maybe the piece was not bad…. interesting! i had a similar reaction after traveling to china nearly 10 years ago–we in the west are goners… but i disagree with you on your assessment of chinese culinary delights–i was utterly in thrall of all the different regional chinese cuisines that we dont find here. the food was amazing.